What inspired you to pick Agbogbloshie as your focal point despite all the other areas you could’ve chosen in Accra? Agbogbloshie just fit perfectly into my projects I want to work on in future. As a young photographer I try and want to work on projects, which I also want to work on in future. 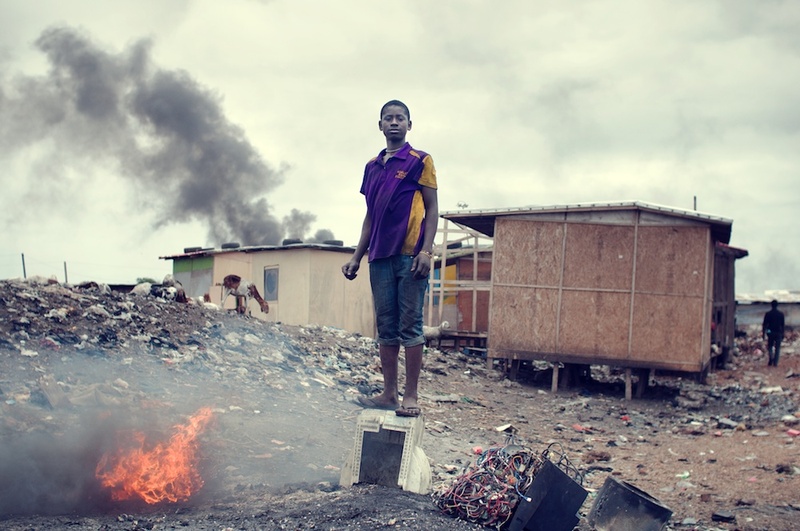 Agbogbloshie and the e-waste problem is one of them. At first the scenery you see in Agbogbloshie caught my eye, so I began to work on specific ideas, stories and pictures. After I made my research I realised, that this is such an important topic and I had to photograph it: its an ethical, socio-economical and environmental disaster. So after knowing all this I contacted local and was planning my trip. I wanted to come back with more portraits and personal stories, instead of describing the vicious-cycles and the illegal dumping again. Thats why most pictures show the boys, girls and men in the center of the pictures and I came back with small stories about all of them. What message would you like this story to speak on to the masses? I tried to put the person and individual in the center of each picture. 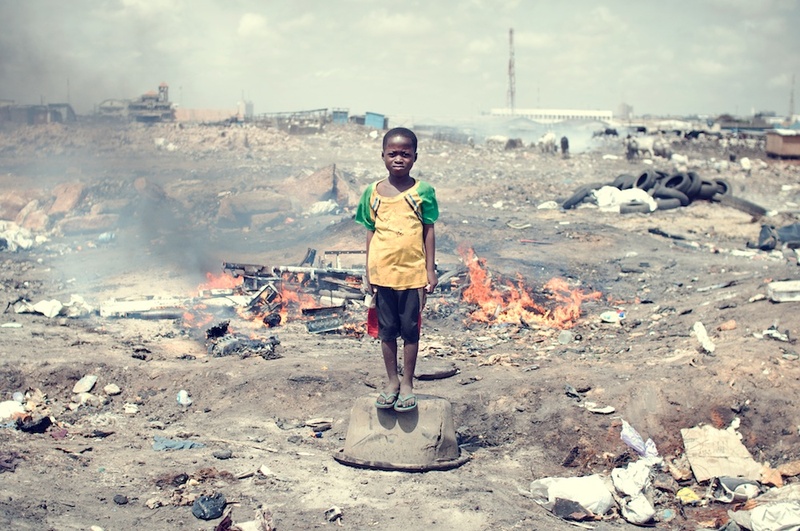 I don´t like it, if a person in such a poverty scenery is just a symbol for the poorness and conditions. Too much info is missing in such a picture. Thats why all people in the photos look into your eyes and staged in the center of the pictures. I also wanted to know exactly the conditions and circumstances of each individual: where do they come from? why do they (have to) come here? what do they expect? future plans? and so on. I am able to tell you a story about everyone of them and thats also the main heart of an Exhibition I created about Agbogbloshie - which is available to everyone, everywhere by the way. I hope people also see the proud, beauty and power in each picture, because even if these people live under bad conditions we shouldn´t display them in a bad and disadvantageous way. What reaction did the people give to you once you began to shoot them? Were they open to your camera? I think I worked a bit different then other photographers before. I went straight through them and asked questions first, get to know them and after a while I asked them to be part in the picture. No one was forced and no one was photographed without his notice, which is clear by eye-contact and the standing on a case/ monitor I think. There was just one guy, who denied my call. He had a wound near his eye, which was looking pretty bad and he didn´t like the idea that people look at him with that - so for me this argument was absolutely understandable. All the other ones seemed very interested to me and respected that I asked them first. Most of them just see a photographer from a few meters, who takes a random shot an leaves. I also gave everyone a Polaroid Picture, what they really liked. You’ve had the opportunity to capture people from all over the world in such a raw way. Who are your best subjects? The best pictures result from real stories I guess. Often photojournalist are not allowed to show a strong interaction and relation between them and the subject, but I like that. People should see, that I´m not invisible and in the middle of something. If people allow me to do that, thats special to me and it happens almost everywhere. None of these people are models, so they don´t act that much and show themselves after a few minutes. So the best subjects are those, who don´t pose and let me enter their world, thoughts and allow me to capture it. Please let us know more about the Pure Earth Benefit Ball and the efforts to raise money for the people of Agbogbloshie. The reasons why I´m joining the Pure Earth Benefit Ball are diverse. At first I (accidentally) met their local partners those days in Accra and know their work. Another one is, that the US is a big exporter of these unfunctionable electronic goods and its important to raise the awareness about this fact. 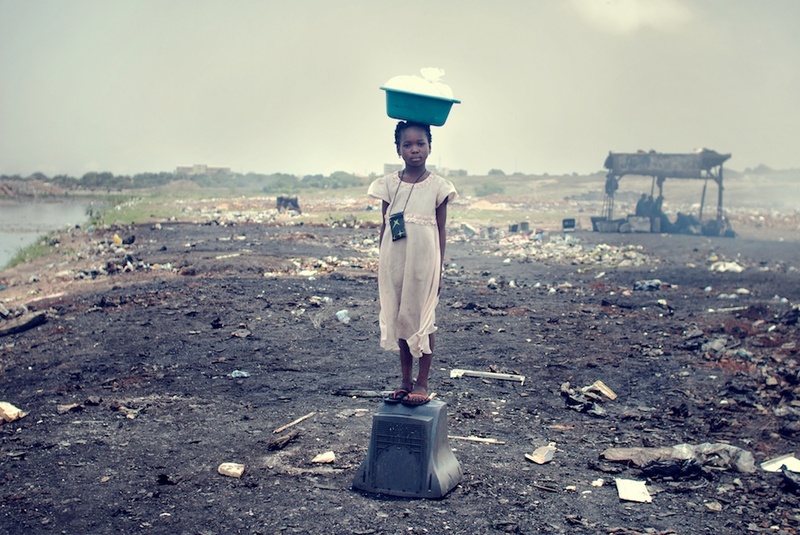 I denied to raise money for Agbogbloshie for a long time and for example don´t collect money with my Exhibition, because in the long run we can´t solve a problem somewhere else, if we produce it in our own countries and export it = we should make sure that we recycle our e-waste and that just usable electronic goods get shipped to Africa, because just that is what they need! So I´m just interested in a long-term solution on a political and international level. But this Pure Earth Benefit Ball could be a start and another signal to change things quickly. On top of that less risky solutions for a proper recycling in Agbogbloshie and other places are barely needed. 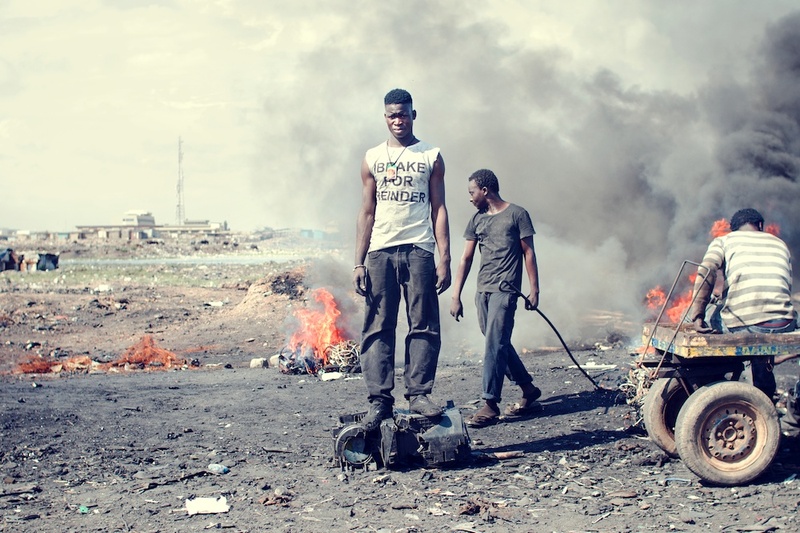 If there are good solutions in Agbogbloshie we could also use them somewhere else and a main problem is that African Countries don´t have recycling and don´t know how to deal with it. But again: the long-term solution should be a different one. We have to do our homework and stop these exports in our harbours. How can people or become involved in helping as well? My best advice is to reduce your own consumption of electronic goods. We don´t need a new smartphone and laptop every year and its quite easy to understand, that if we don´t produce problems, we don´t have to solve them. Its crazy that we know about the risks and consequences, but in the end still produce them. So I guess this is one thing we can change in our everyday life-decisions to make a difference. Besides that we should learn to repair and reuse again, should buy quality (long-life) products, which are more sustainable and make sure, that we give these products at the end of their lifespan to authorised scrap courtyards. By doing this, we automatically show manufacturers and politicians, that its more important to act in such a way and can introduce a change.